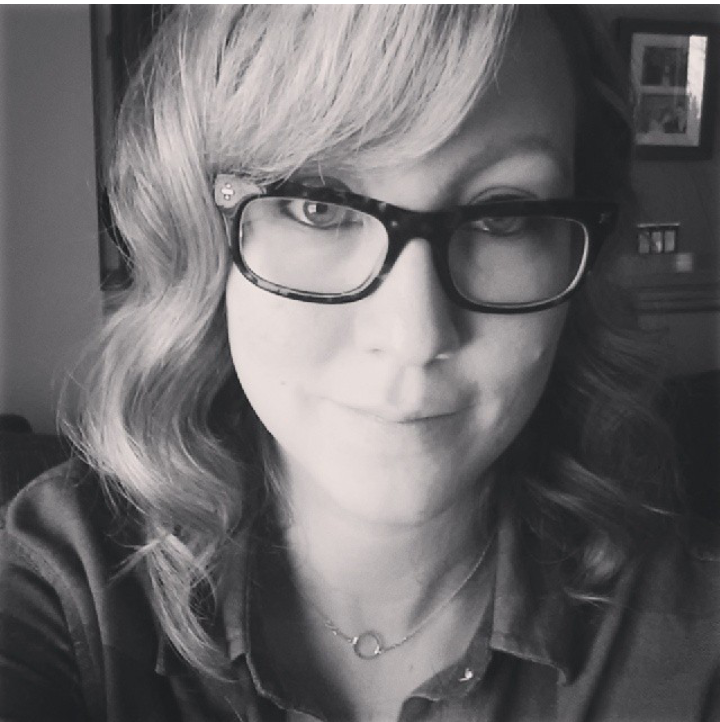 So, I have been planning on doing a cooking post since I started this blog, but so far I have not cooked very much, or at least nothing too interesting to post about (does anybody care about my frozen fish and chip recipe?!). So, finally I tried something that was interesting enough to post about: Thai Butternut Squash Soup. This is the first time I have cooked Thai food that wasn’t from a recipe I learned in Thailand. I have never really trusted cookbooks that call things “Thai” but aren’t actually Thai dishes. But, the recipe looked pretty simple, which in my experience is a signature of Thai cooking, and the ingredients pretty authentic, so I thought I would try it out. 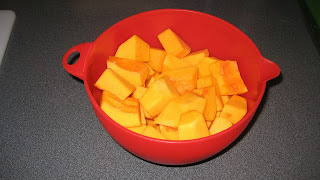 Let me begin by saying I have never cooked with butternut squash before. I have eaten it, but never prepared it. So I had no idea what one even looked like when I went to the grocery store. 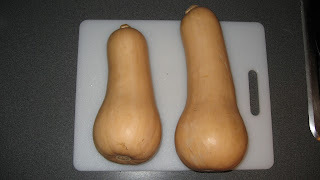 After assuming it was one of the other more normal looking squash, Hubby determined it was, in fact, the one that looks a little *ahem* “interesting”. After allowing a few seconds of immaturity to pass between Hubby and I, we grabbed 2. I then took 1 stalk of lemon grass and bruised it with a kitchen mallet. The recipe said to use the flat side of the knife, but that did diddly-squat, so I brought out the big guns. After that, I chopped it into 1 inch pieces. 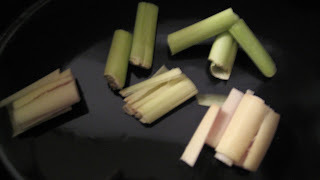 The most important thing I have learned about cooking with lemon grass is that the pieces should be large so that you can fish them out when the dish is done cooking. There is nothing worse than biting into a spicy piece of lemongrass. The texture is somewhat akin to eating twigs. So don’t cut them too small!! 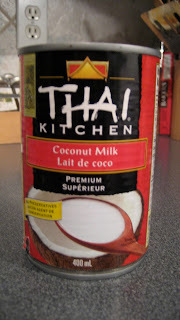 Then I dumped a can of coconut milk into the slow cooker. This is the expensive stuff they have at our local grocery store. I only buy it because they don’t have another option. When I make a trip to the Asian supermarket, I stock up on the equally delicious, but much more budget friendly kind there. 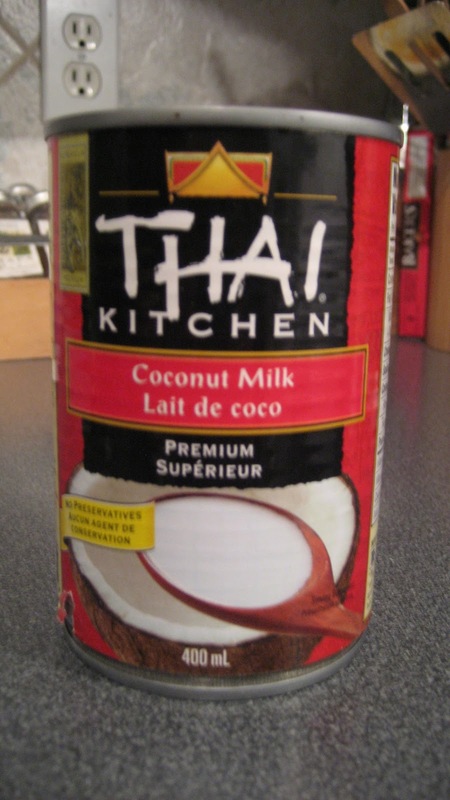 Also, I always use the full fat coconut milk. Using the low-fat is almost never a good idea. It’s much more runny, and you lose a lot of the flavor that the milk brings to the dish. I then sliced up some ginger very finely and tossed in about 5 slices. 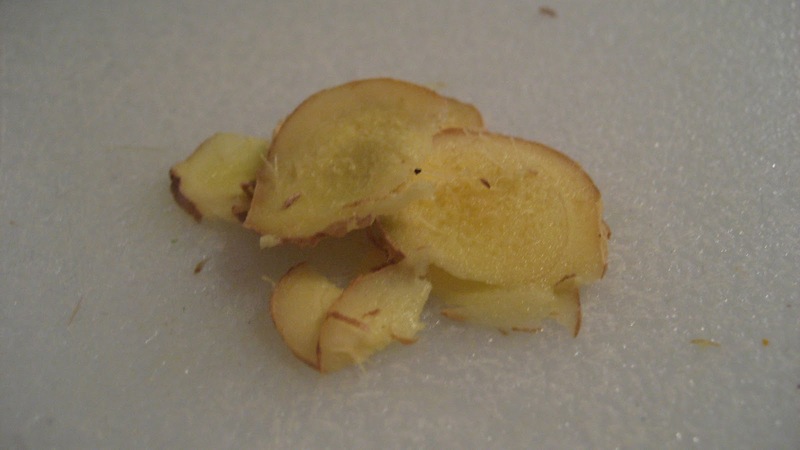 The one thing I hate about ginger is that you always use such a small bit of it, and then I find I never use it before the rest of the thing goes bad. Then I have to throw it out, while feeling incredibly guilty about it, and thinking I should have used it. Starving children could have eaten it…okay, probably not, but still. Guilt. I wish I knew how to save it. Any tips? Then add some Thai red curry paste. I added just over 2 tablespoons, but this is definitely something that can be adjusted to taste. 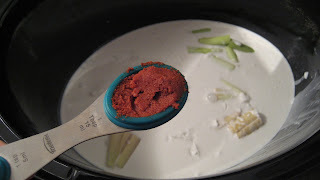 Red curry paste is pretty spicy, so if you don’t like the heat, maybe reduce it a little. Likewise, if you like your Thai food burning hot, go crazy and add more. The amount I added was enough to give it a bit of heat. Normally I would have added more, but pregnancy=heartburn, so I tried to play it a bit safe. 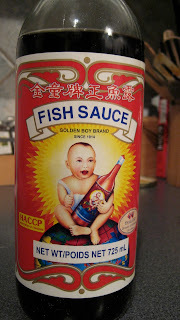 Then, about 2 teaspoons of fish sauce went in. I like the bottle so much. It reminds me of my time in SE Asia, and that happy little baby always brings back the memories. 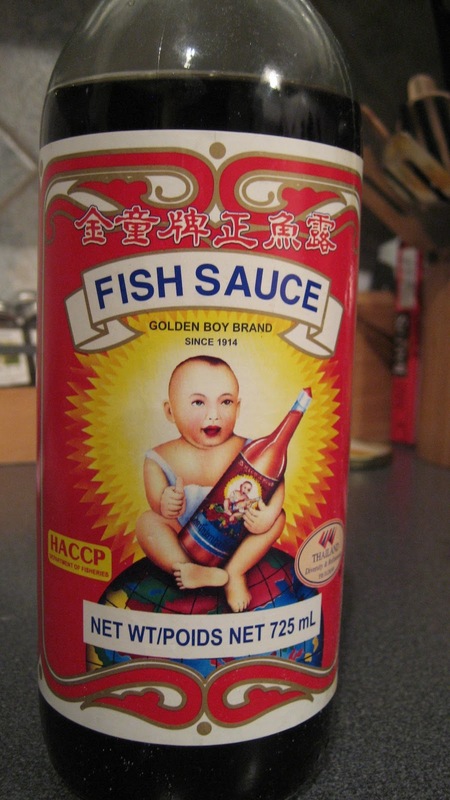 I have no idea why fish sauce has a happy baby as a mascot. No idea at all. Anyway, it sounds disgusting, but it actually brings a lot of flavor and saltiness to the dish. Try not to omit it. I promise the soup won’t taste like fish! 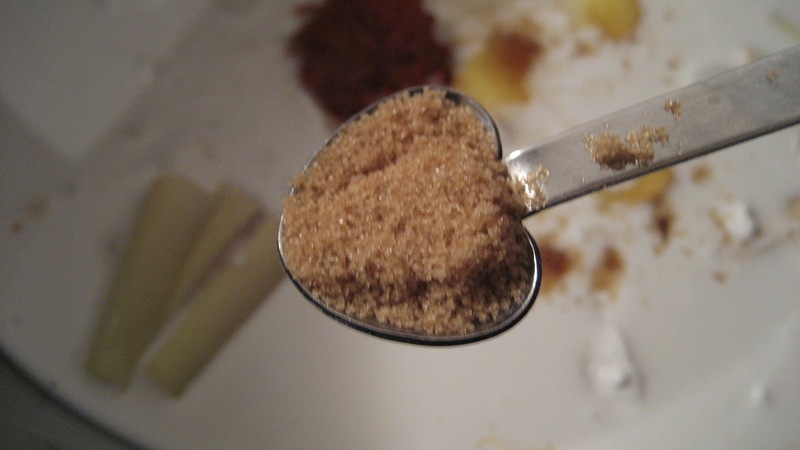 Also, a teaspoon of packed brown sugar for sweetness went in as well. Add the squash, and about 2 cups of chicken stock to the slow cooker. Stir to combine. Then, cook the delicious concoction for about 4-6 hours on the low setting. When it’s done, fish out the lemon grass and ginger. They have served the soup finely, and are being dismissed to the garbage. Thank you! Then, mash the squash until it’s nice and smooth. I prefer to be lazy and efficient and use a hand blender. Waaayyyy easier. After that’s done, you can either enjoy the soup as is, or add some meat. The original recipe called for shrimp, but when I gave Hubby the choice of shrimp or chicken he didn’t even hesitate and picked chicken. 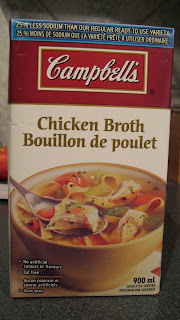 Normally when I make Thai soup I add the chicken when I add the coconut milk, and just poach it in the soup. But as this was in the slow cooker, and I had to mash the squash, I opted to cook the chicken separately and add it in after. I am sure you could just add the chicken at the beginning, and then fish it out to mash. Or, you could just add shrimpies after mashing and cook until they are done. 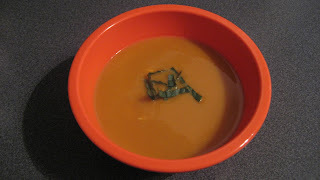 Then, to make the soup look very awesome, and impress your husband or dining partner into thinking you are pretty much a gourmet chef, you can garnish the soup with a little fresh cut basil. Also, it makes me feel like I am on Iron Chef if I “plate” the dish. Awesome. I will try as I love butternut squash. To save ginger, I keep it in a jar in the freezer. It peels/shreds/cuts just fine frozen, and keeps for months. Awesome tip! Thanks a bunch!